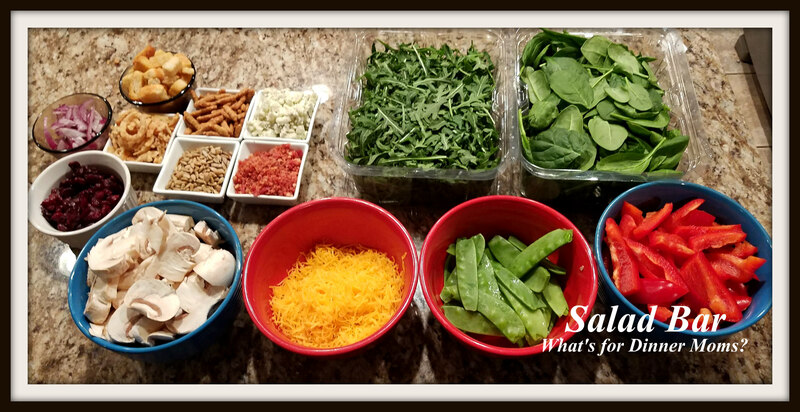 Salad Bar Fixings – What's for Dinner Moms? Hi all! I have been down with an awful cold and the busyness of life lately. I have been sleeping every moment I can to try to feel better. I am getting there except for the weariness that seems to just seep into my bones. I am not sleepy just sore and tired. Meals have been mostly serve yourself – cans of soup, leftovers, or cereal. I am just not hungry nor feeling the will to cook something. Even my kids are fine with this which means they are feeling this way too. They usually will offer to cook if I don’t because they like the whole meal together thing but even now they are kind of indifferent about it. Then of course we ran into Saint Patrick’s Day. As the mom of an Irish dancer it is the busiest time of year. This is one of the dances with my daughter in the blue and silver. Her hip starts to go out at the end of the video. She will be taking a break from dancing for a few weeks to get it healed. This is my daughter with some of the little ones she teaches (as young as 3!). So, we are back to trying to get our eating on track and our first step was a salad bar. I love making these simple salad bars with lots of colorful and small dishes. The kids tend to eat more when I put it out like this. It looks so pretty and attractive. I added chicken strips, sliced deli ham, and dressings to the bar before they ate. Everyone had two large plates of salad. In my book that is a win. Remember to switch it up by changing the kinds of nuts, cheeses, fruits, and sliced add-ins on your salad bar! I hope you are starting to feel better and that fatigue feeling goes away. Take good care, Marci. Thank you so very much, Sylvester! I am trying. I refuse to go into Spring like this. You’re welcome, Marci! Hopefully the warmer weather will help. Looks Delicious. Hope you and your daughter feel better soon! I hope you are feeling better, Marci, and your daughter’s hip is healing. First of all, I hope you are feeling much better soon, Marci. Thanks for sharing the video of your daughter dancing. I hope her hip is doing better soon, too. It is sweet to see those little ones dancing. Thank you, Erika! She is taking a break but I think it is going to be harder on me than her that she is not dancing. She gets really tense without that stress reliever. Thank you. It has been a rough two weeks but getting better each day! What a fun idea and great way to feed the family! Thanks for sharing! !